Many people think of hair loss as something that happens to older men. But in fact, hair loss and thinning hair can happen to both men and women of all ages. There are many factors associated with hair loss in women such as some thyroid conditions or vitamin deficiencies. But one that’s often discussed is the relationship between menopause and thinning hair. At RHRLI, we’re hair loss experts and we offer a state of the art solution. It’s called the ARTAS® System, and it’s a minimally invasive hair restoration procedure that uses robotic technology to give you a healthy looking head of hair. At RHRLI, we treat post-menopausal patients and we want to let you know the facts about the connection between hair loss and menopause. Nolan later discovered that menopause was one of the causes of her hair loss. It’s not unusual to lose hair during and after menopause. According to the Huffington Post, about 40 percent of women experience thinning hair after menopause. One of the key causes of hair loss for women are changes in hormone levels. Huffington points out that some women have increased hormonal levels during pregnancy. Lower levels after menopause can lead to hair loss. But there are other factors that can also contribute to menopausal hair loss. 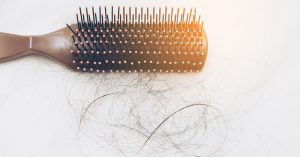 In addition to conditions related to diet and thyroid problems, high-stress levels can also play a role in thinning hair for women. It contributed to Nolan’s hair loss as she was also appearing in a show on London’s West End when she first noticed her thinning hair. If you’ve reached menopause and you’re starting to discover that your hair is thinning, the website Healthline suggests some steps you should consider taking. They recommend finding ways to reduce stress such as doing yoga or monitoring your breathing. Exercise and diet are also important. Exercise can help maintain a healthy hormonal balance. Make sure to eat a balanced diet including whole grains, fruits, and vegetables at every meal. Mono-saturated oils, such as olive oil and sesame oil can help too, as can drinking green tea and taking vitamin B6. Finally, you should keep hydrated and try not to drink too much, juice, soda or sugary drinks. Other factors that can contribute to hair loss after menopause can involve medications or your surgical history. If you take medications, that can contribute to hair loss as well, so you should consult with your doctor. But it’s important to remember not to stop taking your medications unless your doctor tells you to do so. Another valuable consultation could be the one you have with RHRLI. If you have hair loss or thinning hair the only permanent solution available is a hair transplant procedure. RHRLI is the only treatment center on Long Island that has the ARTAS® System. Come to RHRLI and learn about the ARTAS® difference. Contact us today. Previous Post: « What is DHT?